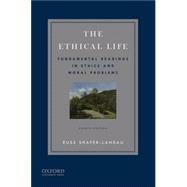 Brief yet thorough and affordably priced, The Ethical Life: Fundamental Readings in Ethics and Moral Problems, Fourth Edition, is ideal for courses in introductory ethics and contemporary moral problems. Featuring forty-two readings divided into four parts--The Good Life, Normative Ethics, Metaethics, and Moral Problems--it introduces students to ethical theory and a wide range of moral issues. The essays include selections from such historically influential philosophers as Aristotle, Hume, Kant, and Mill alongside work by contemporary philosophers like Philippa Foot, Robert Nozick, Peter Singer, and Judith Jarvis Thomson. Detailed reading introductions provide helpful contextual information. Designed as a companion reader to Russ Shafer-Landau's textbook, The Fundamentals of Ethics, Fourth Edition, this volume is also comprehensive enough to be used on its own. Russ Shafer-Landau is Professor of Philosophy and Director of The Parr Center for Ethics at the University of North Carolina at Chapel Hill. He is the author, editor, or coeditor of several books including The Fundamentals of Ethics, Fourth Edition (OUP, 2017). He is also the editor of Oxford Studies in Metaethics. 11. W.D. Ross, What Makes Right Acts Right? 13. Hilde Lindemann, What Is Feminist Ethics? * 19. Kwame Anthony Appiah, What Will Future Generations Condemn Us For? 32. Stephen Nathanson, An Eye for an Eye? * 34. Michael Huemer, Is There a Right to Own a Gun?